Geology is what we look to when we want enduring monuments. Rock and metal outlast anything made of living tissue. Or do they? In another example of science getting poetic, it seems that a symbol of ephemera — a butterfly — provides evidence of a mountain long turned to dust. Monarch butterflies are some of the toughest insects in the world. Their migration takes them from southern Canada to central Mexico. The journey is so long and difficult that it outlasts the butterfly's lifetime. Monarchs lay eggs at different stages through the journey. No one generation makes the whole trip. Along this journey are several sites that have become local treasures and tourist attractions. The monarchs, flying in swarms, group together to rest in small areas, covering the trees like bright orange leaves. But although these sites are the most showy part of the journey, they're not the most amazing. The amazing part of the journey is the sudden eastward turn that monarchs take over Lake Superior. Monarchs fly over the lake, necessarily, in one unceasing flight. That alone would be difficult, but the monarchs make it tougher by not going directly south. They fly south, and at one point of the lake turn east, fly for a while, and then turn back toward the south. Why? 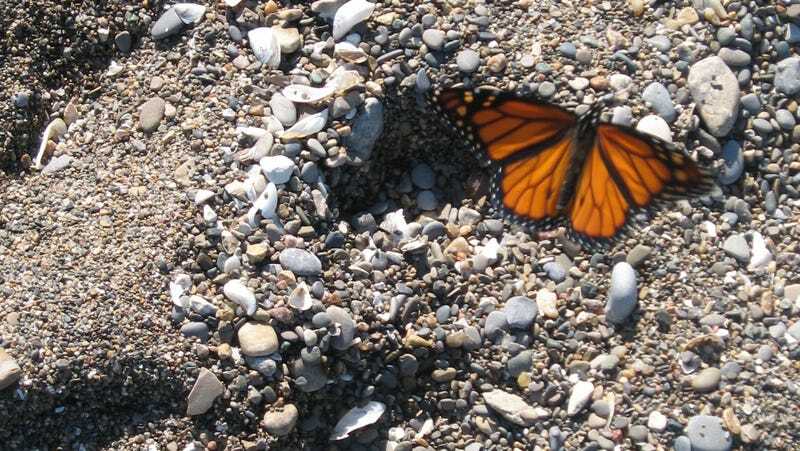 Biologists, and certain geologists, believe that something was blocking the monarchs' path. They believe that that part of Lake Superior might have once been one of the highest mountains ever to loom over North America. It would have been useless for the monarchs to try to scale it, and wasteful to start climbing it, so all successfully migrating monarchs veered east around it and then headed southward again. They've kept doing that, some say, even after the mountain is long gone. This puts a new spin on how we look at geology and geography. We think of mountains as structures that are, nearly, ageless. They stand while successive generations of animals change and evolve around them. Perhaps not this time, though. This time, butterflies kept up their same pattern while the world changed under them, the mountain wearing away, or being destroyed. This time, flesh outlasted stone. Via Pilgrim at Tinker Creek and The Journal of Experimental Biology.